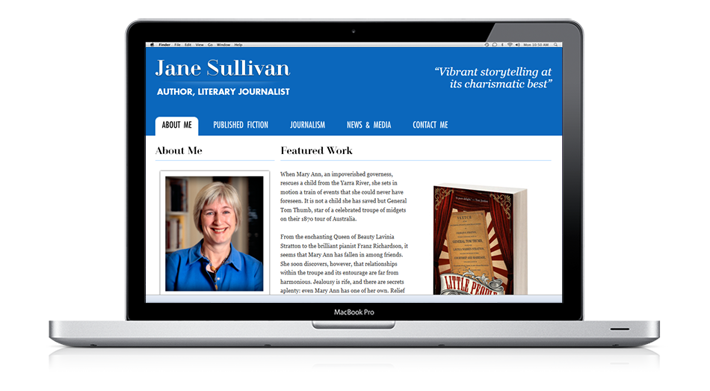 I’m pleased to announce the launch of the website for Jane Sullivan, an Australian author based in Melbourne. Jane is a journalist for the Melbourne newspapers The Age and the Herald Sun. She also writes fiction and has produced two novels, as well as a short story. Her latest novel, titled Little People has just been released, and the launch date of the website was arranged to coincide with this. Little People is a semi-fictional account of General Tom Thumb’s visit to Australia in 1870. Jane is a delightful client, and I look forward to working with her in the future. You can view the entry for the website in my portfolio.